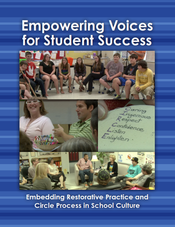 Empowering Voices for Student Success, is a guide for those who want to bring circle process and restorative approaches into their daily practice. To download your free copy, click on the book cover to the left and follow the instructions. Please let me know how you're using it by clicking here. This handbook was funded by the Ontario Ministry of Education's Great to Excellent Grant and Upper Canada District School Board's Student Success Initiative.